With their full-length debut, veterans of the Nashville circuit deliver a country/Southern rock hybrid for the ages. As long as there has been a Nashville sound towards which to rebel, there have been those outsiders exploring the fringes of country music. Whether it be in the form of rockabilly or outlaw country, alt-country or Southern rock, red dirt or the Bakersfield sound, groups of artists have sought to go against the grain, bucking the prevailing commercial trends to create a new and exciting alternate universe version of country music. Tending towards a more traditional element in terms of sound, style and lyrical content, these artists forgo the assembly line approach often favored by Nashville (indeed, the lyrics nearly any modern hit country song read like a form of redneck stereotype Madlibs delivered by singers in designer jeans and $100 haircuts) and forge their own approach within which artists with a similar mentality tend to gravitate towards. That having been said, the rise of Chris Stapleton has, like Willie or Waylon before him, provided mainstream country music with a wild-eyed outlaw streak. That has allowed some artists and groups who might otherwise have remained within the fairly insular, though no less fervent, world of road warriors out to share their music with the people rather than looking to make a quick buck by hopping the current stylistic train. As is often the case with commercial music, it generally only takes one artist to come along and break the mold, borrowing from those who came before yet failed to receive the appropriate recognition (i.e. the Beatles, Nirvana, Radiohead, et. al.) So with Stapleton having ascended the ranks and brought a bit of this alternate reality form of country music to the masses, the time is right for others working within a similar framework to rise up. Nashville guitarists and mainstays Wes Bayliss and Jason Cope found they shared a mutual love of just such a stylistic aesthetic. Cope, having played in fellow outlaw Jamey Johnson’s band, was already well-versed in the sound and feel of this particular form of country/Southern rock hybrid. Together they pooled their collective talents, brought on Johnny Stanton and Jay Tooke on bass and drums, respectively, and christened themselves the Steel Woods. It’s a name perfectly evocative of the sound and feel of their hybrid form of country-southern rock-heaviness. For their debut full-length, Straw in the Wind, the group has enlisted the songwriting talents of fellow outsider Brent Cobb, crafting a series of narrative vignettes rooted in the southern gothic tradition. Nowhere here will you find the prefab references to the materialistic elements inherent in the work of modern country artists like Sam Hunt, Locash, and Chase Bryant. Opening track “Axe” lays bare this concept from the get-go with its lumbering backwoods groove, lyrical evocation of the steel of the ax laying waste to the surrounding forest. “Better in the Fall” continues the autumnal theme, the song’s narrator muses on the hook-laden chorus, "Guess I’m better in the fall / When all is new / I won’t blame myself for not loving you." Rather than reading as maudlin, there’s a cold grittiness to the song and its subject matter that wouldn’t feel out of place in the world of FX’s Justified, the narrator inhabiting the same moralistic gray area that plague’s the series’ characters (indeed, the title track reads as a plotline ripped straight from the series). Add to this some supremely heavy guitars, and you’ve got something akin to the same sort of hulking menace inherent in stoner metal -- albeit with far less fantastical and more intelligible lyrics. It’s a clear update of the Southern rock sound that incorporates elements of the intervening years’ heavy metal bands. Following this sort of outsider/outlaw narrative lyrical through line, “The Well” features a proffering of mutual understanding despite vastly different circumstances: “I know the side of the fence that you’ve only dreamed of / And you know that you’ve got me beat with a family who needs you / Well, pull up a seat if you’ve got the time, listen to me think, I bet we’ll find a piece of common ground that we both can stand on.” Offset by haunting guitar swells that lead the listener out of the chorus, it’s yet another example of a style of southern gothic country and storytelling that wouldn’t sound out of place on a Handsome Family album. Similarly, “Della Jane’s Heart” offers a tragic tale of love lost that could have just as easily have come from the pen of Rennie or Brett Sparks as Bayliss or Cope. 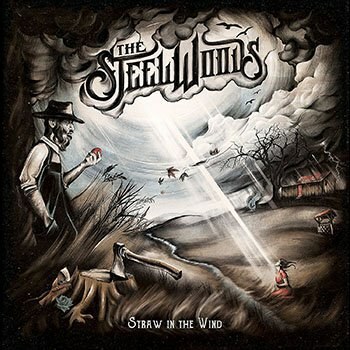 In this, the Steel Woods have managed to create a vivid, character-driven world into which the listener finds themselves drawn and ultimately captivated by. There’s an inherent realness to the lives lived within these songs that rarely exists outside the pages of the most nuanced examinations of human behavior and life on the other side of the tracks. It’s a heavy world of perpetual twilight, everything cast in a shade of steely blue and imbued with an uneasy sense of foreboding. And yet like all great art, Straw in the Wind possesses within its darkness a silver thread of beauty, here coming from the intricate harmonies, impeccable melodic sensibility, and exceptional storytelling. While certainly not for everyone, the Steel Woods offer up a blood, sweat, and tears/truly blue collar alternative to the current crop of artists peddling country music as a corporate-backed lifestyle brand. Yet as they sing in the sublime “If We Never Go,” “If we never go, we will never know what’s beyond these country roads / There’s nothing wrong with home, but lovers oughta roam / Without chances, plans don’t make no sense at all.” Do yourself a favor and spend some time within the world of the Steel Woods.